The Sault Metal Scene: Rotaryfest Stage 2 & Dinunion Concert Previews!! Rotaryfest Stage 2 & Dinunion Concert Previews!! Today's second weekend concert preview post is here, but before we get into that, just a clarification that the Sault Music News Letter Facebook page is advertising 3 Day Millionaires shows at Reggie's West this weekend despite their recent break-up. I assume those were once official bookings before The Millionaires decided to call it quits, but word didn't reach that page beforehand. SooToday's entertainment page lists The Peace Vibe & Algo Rhythms in their place, so hopefully this clears up some loose ends! Now, let's begin the second half of our Rotaryfest weekend concert previews with Stage 2 at Clergue Park, which takes place across 3 days for the first time in it's history under any curator! 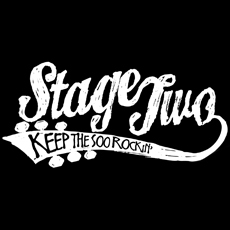 Presented this year by SooToday, musical acts (largely of the original folk, indie, and alternative vein) will take to the "re-directed" stage beside the Art Gallery of Algoma for the most ambitious Second Stage lineup yet, so who all can you expect to see for the 13th installment of Stage 2? Unlike with Stage 1's "Rewind" theme, there is not a theme around band reunions and comebacks here, but there's still a lot of talent to be had! Things start today for the first Stage 2 lineup on a Thursday since 2006, though like with Stage 1, today's roster is hard rock and punk-free, instead harbouring a folk focus. M.D. Dunn (in his third Stage 2 set as a lead performer) and his new backing band The Innocent Weapon Ensemble will headline tonight at 9:00 PM, with remaining acts all being solo performers making their Second Stage debuts. Those performers include Ears & Eyes promoter Jackson Reed's solo project at 8:00 PM, Hannah Lindsay at 7:30 PM, Shae Tull at 7:00 PM, and Jeremy Hannah's now-solo project The Autumn Roots at 6:00 PM. Though not the optimal lineup for hard rock fans, there's a lot of talent and creativity to be had tonight, so keep these performers in mind! TOMORROW will mark the first Friday night lineup on Stage 2 in five years, and it's been equally as long to see a featured out of town band with no local membership, as Toronto electro-pop trio Parallels will bring their up-tempo hybrid stylings to the local stage at 8:30 PM! The condensed Friday lineup will only see three local opening acts, namely hard/alt-rock quartet Id Iota (just the third act to play Stage 2 in three straight years) at 7:30 PM, alt-punk trio A Dire Setback's second straight appearance at 6:30 PM, and Christian rapper Tristan "Bold Noize" Goslow's Rotaryfest debut at 5:30 PM. Tomorrow's Stage 2 bill is arguably of the most interest to punk fans, if not metalheads, and while the four band roster seems short, Parallels should wrap up in time for you guys to head to Stage 1 for Treble Charger at 10:00 PM, and then to LopLops for the aforementioned Id Iota's afterparty! As usual for Rotaryfest's stage lineups, tomorrow's (and tonight's) entertainment is FREE & ALL AGES, so visit the above links for more details, and here's Id Iota live at Rotaryfest 2016! As for SATURDAY, that's the longest lineup of all, and it will be headlined by local/Toronto indie rock standout Jesse Merineau and his solo band at 8:30 PM, in their second straight set on the Second Stage, which will also be a preview of his CD release concert at The Machine Shop next week. Soft/prog rock notables The Wild Iris will play Rotaryfest for the fifth time (and third on Stage 2) at 7:30 PM, while online page-less noise/drone/indie trio Pointless will make their festival debut at 6:30 PM. Progressive rock veterans Machines Dream will tie Porter's record for Stage 2 appearances with their 5th set there at 4:30 PM, while three Stage 2 newcomers will open the proceedings on Saturday. These include reunited indie rock band Great Chamberlain (replacing All Us Others as per this link) at 3:30 PM, country/blues band The Barn Board Trio at 2:30 PM, and funk/hard rock quartet The Elements and guest saxophonist Josh Norling at 1:30 PM, notably making them the only heavier band on this lineup. No word on what happened to All Us Others, though note that they never acknowledged this year's Rotaryfest on their Facebook page. Hopefully all's well, and that Great Chamberlain have a solid debut set! There's lots of local talent to take in on Stage 2 on Saturday, and with a nice progressive and indie bent to the proceedings with a heavy appetizer, things should operate smoothly for music fans of all stripes that day! Like preceding nights, Saturday's entertainment is FREE & ALL AGES, so visit the above links for complete details on this year's lineups, and here's The Elements live! Finally for this weekend's stacked lineup of hard rock concert previews, as we'll head back to LopLops Lounge for their second Rotaryfest afterparty (even if the headliners aren't playing this year), as local alt-hard rock trio The Din will reunite for one night only THIS SATURDAY NIGHT! As hyped in this amusing teaser video, frontman Mike Haggith is coming back to Ontario for this one-off "Dinunion", marking the band's first local concert appearance since the Suburban Sendoff at the same venue nine months ago. If you missed that concert, or want one more chance to see The Din's high energy original attack on a local stage, you won't want to miss out on Saturday! After all, who knows if The Din will ever be back? The aforementioned A Dire Setback will open the proceedings in their second show in as many nights, and they're a fine pick with their own blast of familiar original action, so don't be late for them either! This 19+ concert has a $5 cover charge and 9:30 PM start time in effect. It's great to see Mike, Tammy, and Brandan back together for one more night of Dintastic action, and if you recall their entertaining, proficient, and amusing stage shows from their mid-2010s heyday, you won't want to bypass their "Dinunion" on Saturday! Visit the official Facebook event page for more details, and here's The Din live at LopLops! That's all for today, but stay tuned for our Tym Morrison concert preview and more next! Thanks everyone! Mike Vincent - "Ultimate Chaos" Album Review! !